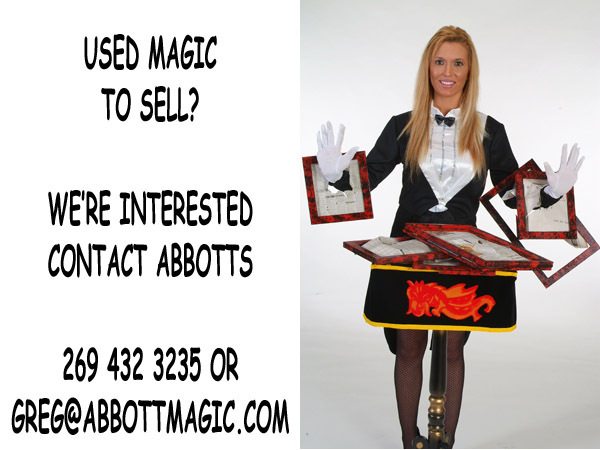 Everyone at the Abbott Magic Company flipped when they first saw this backdrop frame - and so will you! JET SET is the only practical backdrop frame ever manufactured FOR THE MAGICAL PERFORMER! Folds down to three feet long by five inches in diameter and can be set up in less than thirty seconds to make a backdrop frame measuring eight feet high and eight feet wide. Completely self-contained -- no loose parts. Zip, it's up! Zip, it's down! Two Jet Set frames will interlock to make a backdrop measuring eight feet high and sixteen feet wide. This is a high class outfit that is made to our exact specifications to do just one thing--make a backdrop frame! Weighs less than seven pounds! Highly chrome plated. Complete with a seven page printed illustrated folio of instructions. Directions for making your own curtain--no curtain supplied, must be purchased separately. Ideas by Harry Roydon, the Abbott Staff, Ron Bauer and Sandra Kort! Exclusively from Abbotts.